While bringing pages over from the old site, I felt as though I was reliving the last 20 years. Some of the 400+ pages I had not looked at in years. 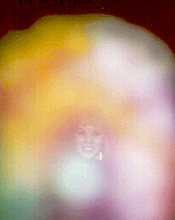 The aura photo page, as I call it, is one of them. I thought about updating the text since it had been written two decades ago, but decided to leave it as is–as a kind of time capsule. The Galactic Federation’s Nibiruan Council has stated that those who choose to move through Accelerated DNA Recoding using the Keys of Compassion will have physical, emotional, and mental proof of their efforts. If you have questions about aura photos and DNA Recoding feel free to email me. 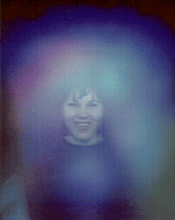 Before DNA Recoding – This aura photo shows that my lower chakras are not functioning properly as seen by the lack of reds, pinks and deeper shades. Also, my aura isn’t very thick or full. It’s just blue, with a tiny bit of pink and thin. My face doesn’t show clearly in the photo either. My guides are more present in it than I am. I’m not completely clear what this means, but I know the clarity of your face means something. Also the amount of guides means something. I understand that when they begin to show up less and less that means you are more able to handle your life, and therefore, they do not have to constantly be hanging around to assist and that is what they are assisting you to do. I had just completed the accelerated DNA Recoding process along with the reconnection of my twelve re-fused strands and the activation of my crown chakra crystals. I have to say that these terms don’t mean a whole lot to me. After all, I am not a genetics engineer nor do I have any medical background. All I know is how I feel and these pictures confirm what I feel. Like most people I tend to be skeptical of any claims made by ETs, so I was very pleased by the results, not to mention relieved that their claim of physical, emotional and visual proof held up. Boy, what a change! And what changes I’ve been through in the last few months.! I feel like I’ve had a number of emotional enemas. One of the things I like most about this process is the way it takes years off of your face. I’m getting younger looking instead of older looking. Guess I don’t have to fear being 40 anymore! As you can see, my aura has finally gotten fatter and thicker. Lots of guides around right now. I’m in a custody battle over my child and they are there to help. 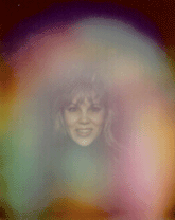 But other than that, the fullness and depth of the auric field shows a lot of clearing being accomplished. Boy, if I had to pay each time I used the Compassion Formula, I would be broke!